Washington: George W. Bush has been an unintentional beneficiary of the Trump administration, his reputation buoyed with the benefit of time and an unpopular president from his own party. The message comes as the shutdown, already the longest in history, nears a 27th day, as Trump’s demand for $5 billion (Dh18.36 billion) of funding for a border wall has met the harsh political realities of a divided government. Some furloughed workers have taken to accepting food handouts amid the weeks without a salary. But Bush’s staff is not going hungry. 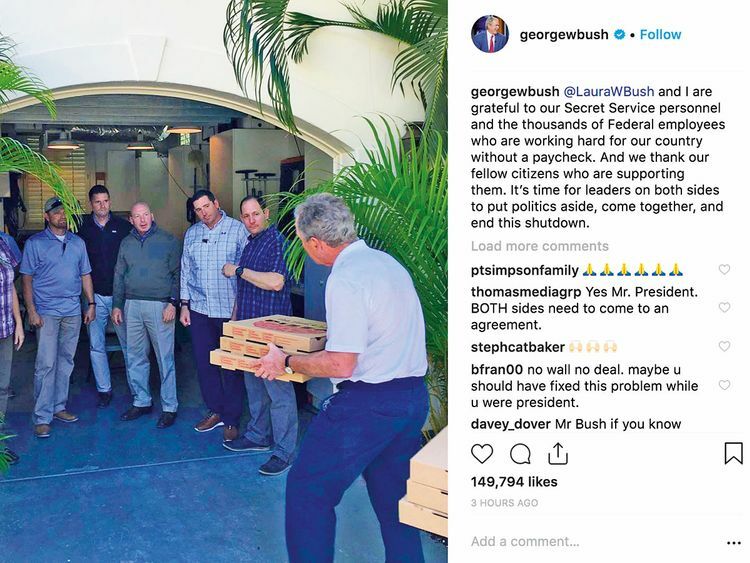 The president bought them at least six pizzas, according to the Instagram post. He punctuated the post with a call for officials to figure out a way to end the impasse, though he did not give specifics. Some 6,000 Secret Service employees are among the 800,000 federal workers not receiving salaries. Spokeswoman Catherine Milhoan said that more than 85 per cent of the agency is continuing to report to work every day but declined to comment on any operational details of Bush’s protection team. “He is buying meals for Secret Service agents on his detail as a small way, however insufficient, to show his gratitude for their hard work without pay during the shutdown,” Bush spokesman Freddy Ford said in an email. Ford declined to answer how many pizzas Bush purchased or how many agents there were in his detail. Bush’s favourability ratings have climbed in recent years, from about 33 per cent when he left office in 2009 to 61 per cent a year ago, according to CNN polls. The gain was powered in large part by significant shifts in opinion from self-identified Democrats. “I never thought I would agree with Bush,” one commenter on Bush’s post remarked.